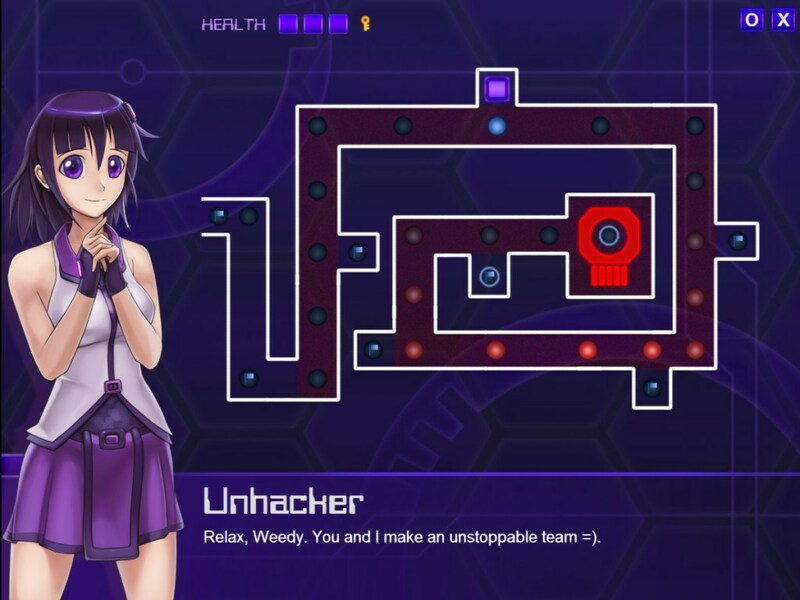 This time the spotlight will be shining on Unhack, a puzzle-y visual novel about saving the world from 5K Worms with the help of chatty AIs. Let’s see if we can’t help it escape the cold emptiness of Greenlight limbo. Unhack is an action puzzle x visual novel title featuring a story about greed and self acceptance. The 5K Worm is corrupting the digital world. Battle the virus and discover who is behind these crimes. Meet ally and enemy AI throughout this ten episode journey. Told ya: 5K Worm! Anyway, as some of you may know, I’m hardly the biggest fan of visual novels, yet upon first playing Unhack back in early 2013 (I think? ), it managed to hook me. Maybe it was the zany mix of brainteasers and witty banter between the protagonist and his AI companion(s), or maybe it was something else entirely. But one thing I do know, is that the game is anything but boring and that its plot brings more than a few twists and turns to the table, all while keeping a steady pace until the credits appear. You’ll be dodging lasers, timing your movement to award getting fried and blasting security guards/bots and more fun stuff, during the course of this cyberspace adventure. What, still not convinced? Well, here’s to hoping my review can do something to change that then. So riddle me this, dear reader: why is Unhack still struggling to get through Greenlight? It’s been out for… well, a grand total of three days! So lack of availability is hardly the reason, eh? Alas, if you haven’t done so already, might I recommend visiting its Greenlight page and handing over a ‘yes’, if you like what you see? Remember: your vote matters! Unhack is available for Windows, Mac and Linux from the official website, priced at $5 and without any DRM.